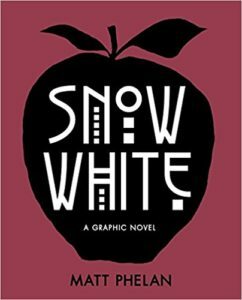 I had a few free minutes in the library, so I picked up this graphic novel version of Snow White. This takes us out of the normal fairy tale and sticks us in New York City in 1928. A young Samantha White, called “Snow”, loses her mother at a young age. Her father, a wealthy businessman, is dazzled by a famous actress and marries her 10 years after becoming a widower. She sends the now teenaged Snow off to school. She starts to see messages in the stock ticker tape, (perhaps illusions caused by gin or something like that.) For some reason, she murders her ill husband, and is not pleased that her husband changed his will before he died to give his daughter 3/4 of his estate. Snow, realizing her danger, runs away into the city, where her stepmother’s lackey lets her go. Snow is rescued by 7 ‘little men,’ who turn out to be street-rat boys. They stubbornly refuse to tell her their names, which is both an action of a stubborn boy and the action of someone who has to protect themselves. The art is very simple (at least to me it is,) which is not a bad thing. We deal with mainly black, white, and red colors. Moving the story to 1928 gives it a different feel. There may or not be actual magic involved in the story – that part I suppose is open to interpretation. Instead of a magic mirror we have a stock exchange ticker tape, which could be magic or the gin. And is the apple poisoned with a magic potion or with real poison? And the actions of the seven boys at the end could have actually happened. I feel like this is a slightly gritty, not too girly version of Snow White that would appeal to many types of readers! Share the post "A slightly more realistic fairy tale"